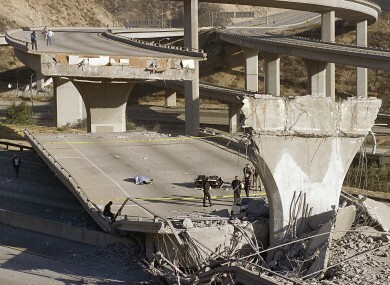 A 1994 file photo of the body of a police officer on the State Highway 14 overpass in Southern California following the Northridge earthquake. BEYOND THE SUNSHINE, the palm trees and Hollywood, if there is one certainty in California, it’s that a massive earthquake will strike at some point. But when the Big One hits, a recent report says, the western state is ill-prepared and local officials as well as major businesses need to face that reality to “prevent the inevitable disaster from becoming a catastrophe”. Drafted by a group of business and policy leaders, the report identifies several key areas that need to be addressed before a quake as strong as a magnitude 8 happens, notably aging infrastructure, water supplies and the risk of catastrophic fires. One of the biggest vulnerabilities, the report states, relates to the Cajon Pass, a narrow mountain pass where the mighty San Andreas Fault intersects with key lifelines, including freeways, railway lines, gas and petroleum pipelines as well as electric lines. A major earthquake on the San Andreas, one of California’s most dangerous faults, would cut most lifelines in and out of southern California, preventing critical aid from reaching some 20 million people and hampering recovery efforts, experts say. The quake would also rupture flammable pipelines, triggering explosions and fires that could burn out of control. “Anything that comes into southern California has to cross the San Andreas Fault to get to us – gas, electricity, water, freeways, railways,” said seismologist Lucy Jones, who acted as advisor for the Southern California Disaster Risk Reduction Initiative committee, which issued the report. “Most of the water that we get has to cross the fault to reach us but when the earthquake happens, all of the aqueducts will be broken at the same time,” Jones, known as California’s “earthquake lady”, told AFP. She said one way to get around this dependency was to look at alternative water sources, including from contaminated aquifers beneath the Los Angeles area that could be cleaned up, albeit at a massive cost. The best defense against a broken aqueduct is to not need an aqueduct. Installing automatic shutoff valves on natural gas and petroleum gas pipelines that run near the San Andreas Fault could also help prevent major fires, according to the report. As for maintaining communication with the outside world once the Big One strikes and disrupts energy grids, Jones said solar power could be one answer. Also addressed in the report is the vulnerability of many homes and buildings in southern California, where local communities have yet to follow the example of the city of Los Angeles in requiring that structures that risk collapsing be retrofitted. In addition, experts say, building codes need to be reviewed to make sure that not only will structures not kill people but will remain standing and usable after a major quake. “Today, we are building in a huge financial vulnerability,” Jones said. We are not going to kill people with these buildings but we are not going to be able to use them afterward and that’s a big deal. For 1-2% more of the cost, we could most likely make buildings still usable. Computer simulations by the US Geological Survey (USGS) suggest that a magnitude 7.8 quake on the southern end of the San Andreas fault would cause shaking for some two minutes, killing at least 1,800 people, injuring 53,000 and causing $213 billion in damage. The largest recorded earthquake in California was the 1857 Fort Tejon quake that ruptured the San Andreas for 225 miles (360 kilometers). Scientists say pressure and seismic energy has since furiously been building along the fault, which constitutes the boundary between two moving tectonic plates – the North American and Pacific plates. “It is inevitable that we will have a big earthquake because that pressure needs to be released,” said Robert Graves, a seismologist with the USGS. He said that given the certainty that disaster will strike, California needs to address head-on vulnerabilities to minimize the impact. “We need to get people to recognize that an event like this is a community event and we are at the beginning of that process,” Roberts said. “This is more than say me as an individual making sure my building is gonna be safe. “If all the other buildings in my neighborhood are knocked down and the water delivery system and power aren’t working, it won’t matter that my building is safe,” he continued. So we are in this together. Email “A massive earthquake will inevitably hit California in the future, and experts warn the state is not prepared ”. Feedback on “A massive earthquake will inevitably hit California in the future, and experts warn the state is not prepared ”.